ATLANTA — Solving the cosmic riddle of dark energy will require scientific creativity and funding for fundamental research, Nobel Prize-winning scientists said Monday (April 2). In this era of tightening budgets and an emphasis on how science can help society, it's important to invest in basic research that doesn't have obvious applications, said Saul Perlmutter, one of the 2011 winners of the Nobel Prize in physics during a session here at the April 2012 meeting of the American Physics Society. Perlmutter, a physicist at the Lawrence Berkeley National Laboratory in California, helped discover that the universe's expansion is accelerating — a fact that scientists attribute to a mysterious entity dubbed dark energy. Perlmutter shared the prize with Adam Riess of Baltimore's Space Telescope Science Institute and Brian Schmidt of the Australian National University. 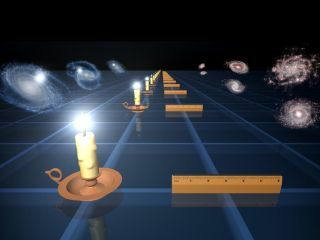 To figure out just what dark energy is, precise measurements of the distant universe are essential, Perlmutter said. Some of the complex instruments needed for these observations, such as Europe's Euclid space telescope and NASA's Wide-Field Infrared Survey Telescope (WFIRST), are now being planned. "Back 12 years ago when we first asked, 'OK, what are we going to do about the fact that we're seeing an accelerating universe? ', it was very clear that it was going to be a good decade in front of us before we could get to the point where we can do these projects," Perlmutter said. "I'm hoping we now move forward and get to see them produce the data." Yet the funding for WFIRST has been cut, and the project delayed, while NASA strains under a diminishing budget. "Right now with WFIRST delaying so much the Europeans are planning to fly a mission called Euclid, which could move ahead of ours," Riess told SPACE.com. "We may reach a point where we had all this leadership in this field and we've ceded it. And that would be a shame, I think, because we have such a good start on it." "The work would not have survived in a conventional funding model," Perlmutter said. "In our case we did not get the result in the three years we proposed, or in the next three years." He and his team spent about 10 years gathering enough evidence to conclude that the universe's expansion was accelerating. He credited the U.S. Department of Energy's national laboratory system, as well as funding from the National Science Foundation and NASA, with giving the scientists freedom to push through on their quest. "I'd say the danger today is, we're trying to do the same sort of thing in a world in which that's not as common," Perlmutter said. "There's much more micromanaging" of the work that's carried out under grants today. He urged funding agencies to support investigations of some of the fundamental mysteries of the universe, even if their immediate applications for society aren't apparent. After all, Einstein's investigation into the nature of time ultimately led to his theory of relativity, which now enables the GPS (Global Positioning Satellites) we depend on today. "There are outcomes of doing very fundamental work that have nothing to do with what it develops for society," Perlmutter said. "It has to do with the way you energize a group of scientists. You end up with communities of people who are responding to the encouragement to take risks and do these ambitious, difficult projects." "You have to energize the scientists in order to get these results, and I'm afraid we may be drifting toward being so safe" that such projects won't survive," he said.